Ancient Mesopotamia, which translates "the land between the rivers", was site to one of the world's first empires. Shumer, or Sumer, was the first recorded empire in World history. Ancient Sumerians were some of the most advanced and developed people of the ancient world. Interestingly enough, however, very little is known of their origins. Ancient Mesopotamia plays an integral part in the history of Canaan and Israel . It was from Ur, located in southern Mesopotamia, that God called Abraham to leave and migrate to Palestine. Kings from ancient Mesopotamia and Babylon appear throughout the Old Testament. The Tower of Babel was built in ancient Mesopotamia - near modern day Baghdad. After the Babylonian destruction of the First Temple, many Jews were exiled to Mesopotamia. The descendants of these exiled Jews were present on the day of Pentecost. The great prophet Ezekiel wrote from the banks of the Chebar River. Great empires, such as the Sumerian, Akkadian , Babylonian, and Assyrian empires were born in ancient Mesopotamia. These empires all played vital roles in shaping the history of the world. 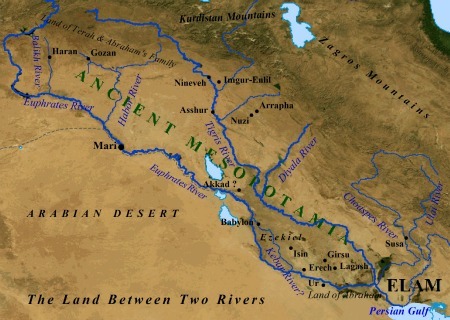 The Tigris and Euphrates rivers dominate Mesopotamia. These rivers originate in the mountains of eastern Turkey and flow southward (south-southeast) to the Persian Gulf. They were the very life support systems of ancient Mesopotamia, as all life revolved around the waters of these two great rivers. 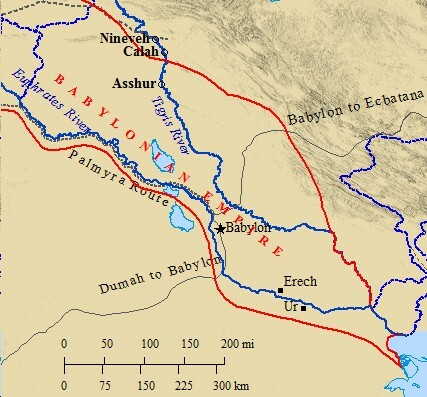 Cities in Sumeria, and later Babylon, sprang up on the banks of these mighty and ancient rivers. Near Baghdad these two rivers come within twenty miles of each other, and eventually merge into a marshland near the gulf. Many scholars believe the Tigris and Euphrates associated with the Garden of Eden are the same two rivers that exist today. 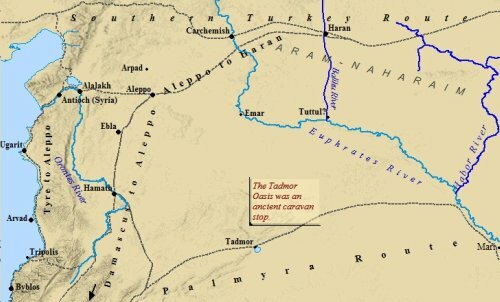 In fact, some believe the Garden of Eden perhaps existed south of Ur, where in antiquity two other rivers merged with the Tigris and Euphrates. The area has long since been covered up by the waters of the Persian Gulf. The Euphrates is the longer of the two rivers at 1,780 miles long, while the Tigris runs at 1,150 miles long. 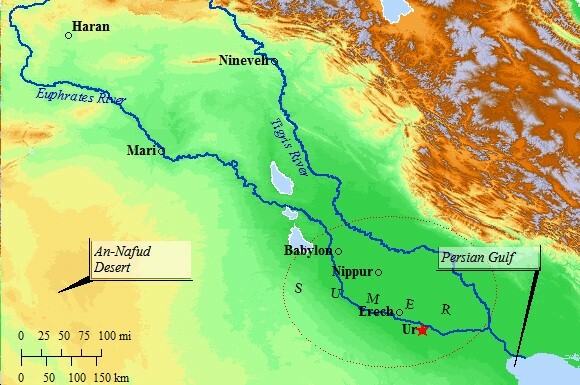 These rivers were so important to ancient Mesopotamia that nearly every major city can be found along their banks. If a river changed its course, which the Euphrates occasionally did, then towns effected adversely by the change declined and were soon abandoned. Both rivers combined with melting snow from mountains in the north and flooded annually.However, the waters were unpredictable, at times being insufficient and at other times turning violent and dangerous. Consequently, the Tigris and Euphrates were not nearly as useful for farming as the flooded waters of the Nile in Egypt. People needed a way to control the water. The gods in ancient Egypt were held responsible for irrigation and complex water systems. The inhabitants of southern Mesopotamia, too, credited their gods and used a complex series of dikes, canals, dams, and other irrigation techniques, to provide a consistent supply of water. Ancient Mesopotamia, starting with Sumeria, was a very advanced civilization. Overnight they seemed to have built massive cities and complex irrigation systems. Baghdad serves as a rough dividing line, separating the differing climates, geography and resources of north and south Mesopotamia. Southern Mesopotamia is flat, formed by sediments from the rivers and soil blown in by the desert. Summers are very hot, averaging 95 degrees Fahrenheit in July. Winters, however, are mild. Rainfall is scarce in this region, thus crops depend on irrigation. This area also lacks many resources. Metals and timber had to be imported. However, this area produced abundant supplies of barley, and some wheat. Dates and sesame oil provided carbohydrates. Fish was the staple meat of the region. North of Baghdad the geography is quite different. Steppes and uplands make up this part of Mesopotamia. Some sections of this region receive as much as 20 inches of rainfall per year. Summers in the north were much milder than in the south, yet the winters in the north, due to the higher altitudes, were much colder. Located on the headwaters of the Persian Gulf, Ancient Israel can be traced back to this Sumerian city of great antiquity. Ur was located on an important branch of the International Coastal Highway. It was also the homeland of Abraham, though whether or not he was born in Ur is in question. Ur was a very large and important city, founded as a commercial center before the first dynasty of Sumer was established in 2500 B.C. One estimate placed the population of Ur in 2030 B.C. at 65,000 people. Dating back to the 5th millennium B.C., Ur thrived as a settlement, and by 2600 B.C. was one of the most important cities of the Ancient Near East. This is evident by the great architectural works found here. A Great Ziggurat Temple was constructed in Ur near the end of the 3rd millennium, perhaps a copy of the much earlier Tower of Babel. Ur's Great Palace has been dated back to to the 24th century BCE, and is the earliest known residence built for a King. Royal tombs attested to the great stature of Ur and the wealth the ancient city possessed. 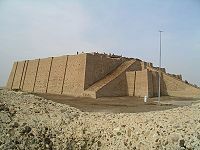 The Great Ziggurat of Ur from before the time of Abraham. Ur, however, was entangled in the idolatry and mythologies surrounding the Sumerian system of belief and religious practices. It was no doubt heavily influenced by the rebellion centuries earlier of Nimrod, and the subsequent rebellion of mankind against God and His statutes. Thus, it was not fit for a family of God, such as Terah's - though Scripture suggests Terah had many gods. In His greater plan, however, God called Terah to pick up and leave for the land of Canaan. Canaan, however, was a wild frontier compared to the much more civilized Mesopotamia. Though occupied by many people and heavily fortified cities, Canaan lacked the resources and might of Egypt and Mesopotamia. It was often caught in the middle of the two great empires of antiquity. At the time of Abraham's calling, ca. 2200 - 2000 BC, ancient Mesopotamia would undergo and a great upheaval brought on by invaders from the western deserts. God called Terah to leave at precisely the right time in history. It would be up to Abram to trust in God and leave his birthplace and family behind. However, the connection between ancient Mesopotamia and ancient Israel is clear. It was from within the Sumerian civilization one of Israel's greatest Patriarchs was called forth. From the cultured city of Ur Abraham left for the far-less civilized Canaan. CLICK HERE TO SHARE YOUR THOUGHTS & COMMENTS Are you a student of ancient history? Do you love world religions and their origins? Click on the above link to give your insight, share thoughts, questions, and make comments! Near modern day Mosul lies the heartland of the ancient Assyrian empire. 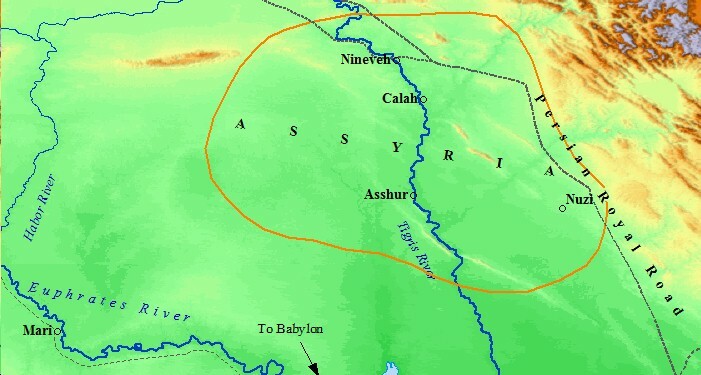 Nineveh, Calah (Nimrud) , and Asshur were the major cities of this time. In this region timber and building stone were used to construct the royal palaces, houses and temples of the Mesopotamian kings and elite. Assyria could not produce enough barley and wheat to be totally self sufficient, thus supplemental food supplies had to be imported in. Assyria had a significant impact on the history of Palestine. Metals, such as copper, tin, iron, lead, needed for weapons and such, had to be imported as well. The Assyrian Empire was born on the banks of the Tigris River. For these reasons, Assyria often sought to expand its empire, south to Babylonia, and west to the Mediterranean. In its quest for expansion and resources, Assyria left an indelible finger print on the history of Palestine. Due west of Assyria is northwest Mesopotamia, known for its fertile land and grassy steppes. The Balikh and Habor rivers supply ample amounts of water to this region. Along with the high winter rains and the many small streams, this area is very desirable for raising sheep and grazing cattle. Genesis 24:10 and Deuteronomy 23:4 use the term Aram-naharaim, which is translated "Mesopotamia", and refers to the land between the Balikh and Habor rivers. 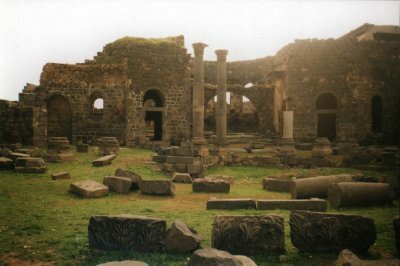 The Bible closely associates Abraham with this region, specifically the city of Haran. It was here that Abraham settled briefly before continuing on into Palestine, forever changing the makeup and history of Palestine. Aram - Naharaim had a significant impact on ancient Israel, as well. Abraham migrated from Ur, in southern Mesopotamia near the Gulf, to Haran, in northwest Mesopotamia. It was in Haran that Abram's father, Terah, died. Abraham then picked up and departed for the land of Canaan. However, later in his life, he sent his servant back to Aram-Naharaim to find a wife for his son, Isaac. This wife had to be of pure blood, thus, from Abraham's father's household. People from this region had frequent interactions with the ancient people of Israel, and Canaan as a whole. Many of the traditions found in the Bible have mirror stories in Mesopotamian creation stories. Some claim Enoch of the Bible, is in fact, Enkidu of the Mesopotamian flood story. Click on the link to view maps of ancient Mesopotamia! Have you been to the Middle East? Are you a student of Mesopotamian history? Do you live in modern day Mesopotamia? Share your thoughts, experiences, and questions here! Ancient Mesopotamians typically married between the ages of 11 to 16.